Instead, here we will see how to prepare a ribeye steak after dry aging it, as well as some differences between dry aged vs wet aged ribeye steaks – all through the eyes of an experienced and professional pitmaster. When your ribeye is done dry aging (whether that is after 35, 60 or other amount of days), the obvious first step is removing the dry aging bag. This will generally be a quick process, even when the plastic seems to be stuck to the meat. Next up, you’ll want to trim down the waxy layer that has formed on the outer side of the ribeye. It’s about 1/8th of an inch thick, and is quite tough, so it might take some time to complete this task. Don’t forget to remove this layer from the fat cap as well! Finally, once this tough skin is gone, you can go ahead and divide the larger cut into individual steaks. You can cut these as thick or thin as you like, according to preference! 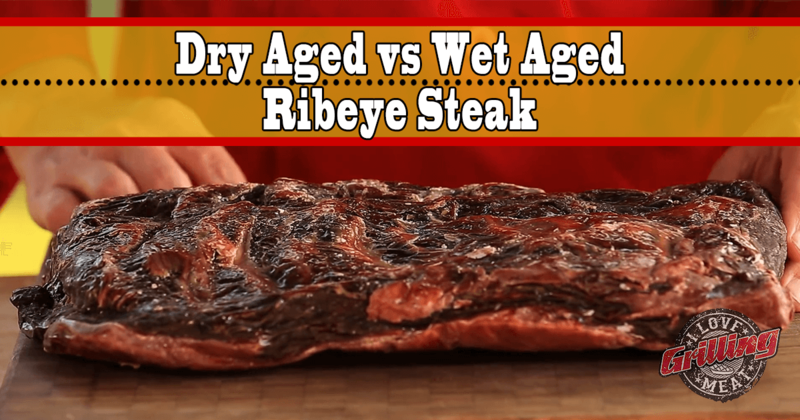 Dry aging a steak gives you a number of advantages over wet aging. The beefy flavor and smell of the meat is amplified and enriched with a lot of earthy tones. The color of the meat will also turn darker and richer. The beef will retain its tenderness. On the other hand, the meat will lose a significant proportion of its volume- but this negative is completely outweighed by the fact that you now have tripled or even quadrupled the value of your meat.